Royal Canadian Artillery – 6 Anti-Tank Regt. Veteran of the first World War, enlisting with the Royal Canadian Horse Artillery at the age of 18 years. 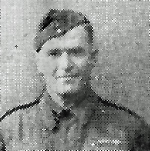 Postmaster of Simcoe for four years prior to 1939, Sgt C. Bowyer, son of Mr. and Mrs. W A Bowyer of 118 Norfolk Street South, was killed in action in Normandy on Friday July 21 according to information received by his family on Monday. Sgt Bowyer was a veteran of the first World War, enlisting with the Royal Canadian Horse Artillery at the age of 18 years. Following approximately three years of overseas service, he farmed for sometime in the Stoney Creek district. For a number of years he was a member of the Norfolk Regiment of Canada, holding the rank of Captain. He enlisted for active service in this war in April 1942 with an anti-tank battery. Following a period of training at Brantford and Petawawa, he went overseas in the summer of 1943. He arrived in France a few days after the invasion got under way. A letter was received from him by family about ten days before they learned he had been killed. Forty-five years of age, Sgt. Bowyer was born in North Walsingham where he received his public school education, later attending Simcoe High School. Besides his parents and wife, the former Ethel Butler, he is survived by three sons, Flying Officer, Donald Bowyer of Dafoe, Sask; AC2 Keith Bowyer of St. Hubert, Que; and Douglas at home: and two daughters, Melina? and Glenna both at homes. There are also three brothers. Owen Bowyer of Stoney Creek, Brant Bowyer of Regina and Clayton Bowyer of Simcoe and one sister, Mrs. Allen Reid of Lynedoch.